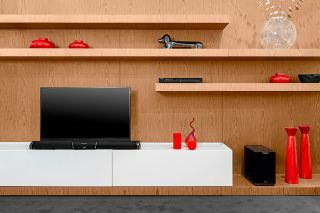 Cabasse introduces Stream BAR with multi-room capabilities | What Hi-Fi? The Stream BAR is the latest addition to Cabasse’s Stream series of multi-room products. It supports network and Bluetooth streaming and comes with a wireless subwoofer. French audio manufacturer Cabasse has fitted the Stream BAR with two custom-designed tweeters and four mid/bass driver units. The six drivers are powered via three-way amplification and are backed up by a 100W wireless subwoofer for some extra low-end grunt. The Stream BAR connects to a TV via HDMI and supports Audio Return Channel (ARC), so can be controlled using a TV remote control. The soundbar will support up to four digital sources via aptX Bluetooth streaming, wi-fi and ethernet for streaming from the internet, network streaming via DLNA and files stored on USB devices. You can also connect to the Stream BAR via 3.5mm auxiliary input and a remote control is supplied to select between the sources. Internet and network streaming opens up access to internet radio stations, Deezer, Qobuz, Spotify and Tidal. It seems fair to say you shouldn’t be short of music choices. If you don’t want to use the supplied remote, you can control the soundbar via the companion Stream Control app for iOS and Android devices. Once you’ve chosen your source, Cabasse says the sound delivered offers “breathtaking 3D effects” but “preserves the integrity of timbres and the natural sound of voices”. To further enhance the sound, you can connect the Stream BAR to the other Stream components in Cabasse's range, including the Stream BASE and the Stream Source. We’ve just received delivery of the new soundbar, so will be testing it soon. It will be available to buy from early September for £899.